You’ll have to sacrifice visual quality for performance. 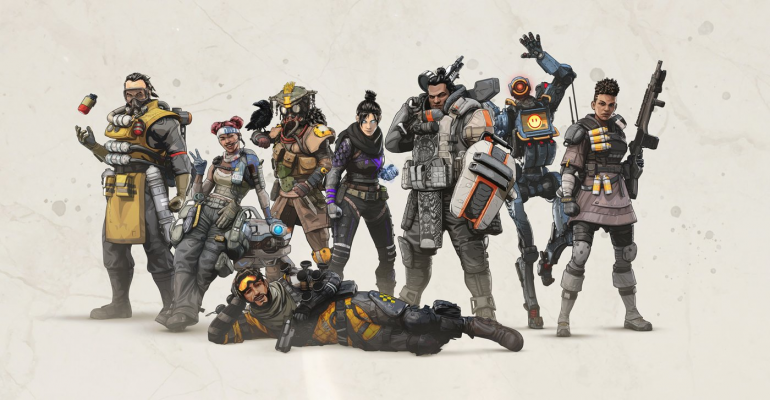 Apex Legends is the latest battle royale hit on all platforms. It’s free to play with very few microtransactions that aren’t required to get the full experience that the game has to offer. Compared to other battle royale games out there, Apex Legends can be a bit too graphics-intensive for some PC players who have low to mid-end builds. Its system requirements for PC players say the user must have at least a 1GB GPU and 6GB RAM to play the game, but developer Respawn recommends an 8GB GPU with 8GB RAM to optimize it. But there are a few ways of optimizing Apex Legends in any PC build. 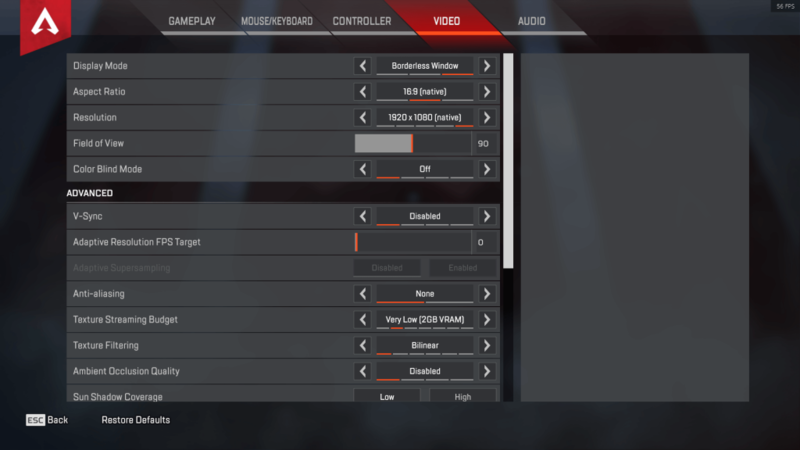 These are standard settings you can tweak that can greatly improve your FPS and let you run the game more smoothly, trading graphics for performance. The easiest way of doing so is tweaking the settings inside the game before trying to mess with your computer settings. After you get in the lobby of Apex Legends, you’ll see the gear icon in the bottom right indicating the settings menu. When you click it, a new window will open, and you can click on the “Video” tab to open the menu below. The best way to optimize your FPS in Apex Legends is to exaggerate first. Turn off every visual effect and reduce the quality of models and graphics as much as you can, then start turning them back on or improving the quality as you wish while checking how it affects your performance. These should all increase your PC’s performance while playing Apex Legends, improving your FPS greatly. V-Sync is another setting that can be turned off, but the best setting varies in every machine. Test it out and see what’s best for you. After that, test your FPS in the Training mode. Check if your FPS is decent and if the game is running smoothly. You’ll notice the graphics won’t be that great, but you’ll still be able to clearly see what matters, such as enemies, items, and important environment elements. Start enabling or disabling items as you wish to check how much they affect your performance and graphics. If you want to sacrifice everything for the sake of your FPS, or if the previous settings didn’t help enough, you can tweak a few additional settings to play Apex Legends more smoothly. Please note that these are settings that will also put you at a competitive disadvantage compared to other players. Reduce your field of view a few units. This will change the angle your character’s camera covers, which means it will make you see fewer things to your left and right that would otherwise be visible. This will have a great impact on your FPS. If you decrease your resolution, you’ll directly reduce the load on your graphics card, which will increase your FPS considerably. But this comes at the price of seeing important game elements less clearly, like enemies who are too far from you. They’ll look pixelated if you reduce your resolution too much. Putting the game in windowed mode might help a bit with how clearly you see enemies. 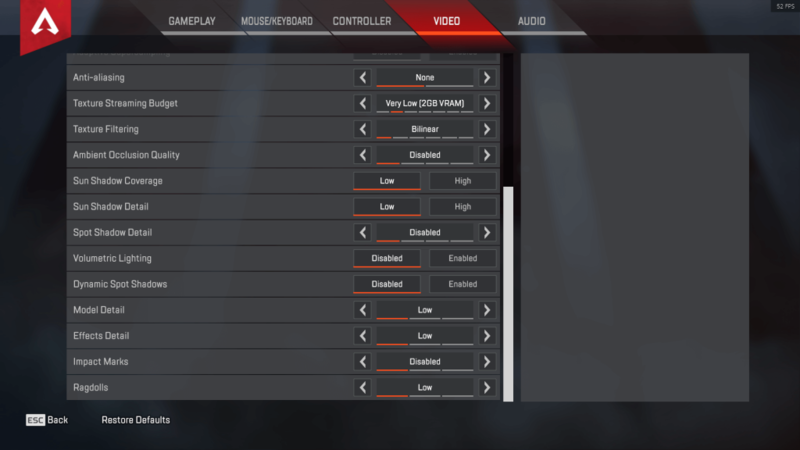 These are the best settings you can use in Apex Legends to improve your FPS. If you still can’t run it the way you want, make sure your build meets the minimum requirements—and if it doesn’t, consider what’s worth more: Buying a console that will be ready to run the game with great graphics, or upgrading some PC parts to run Apex Legends better.